One of the most valued and expensive coffee beans, comes from the island of St. Helena. |This volcanic island, was the place where Napoleon was exiled too in 1815, until his death in 1821. He was known to have said that the only thing good there was the coffee. On St. Helena you will find that it grows one of the most expensive coffees you will find in the world. The island is situated 1200 miles west of Africa, out from the country of Angola, and 2485 miles east of Rio de Jenerio Brazil in the South Atlantic. The island is only about 47 square miles in size, with the highest point being 2684 feet, and with a population of a little over 4000 people. The green tipped Bourbon Arabica bean arrived in 1733 from Mocha, Yemen by captain Philips of the East India Company. This bean grown on the island has a perfect balance of acidity, and a stunning mix of fruit, spices, and chocolate in its aroma. It is picked from the months of October to February, and grown at an elevation of 2360 feet. The very high quality of this coffee was noticed in London, England not long after Napoleons death, and was sold at a higher price than any other coffee at the time. By the middle of the 20th century coffee production on the island had reached its peak, and in another 15 years or so had died out completely. In the start of the 21st century a Mr David Henry from the United Kingdom came to St. Helena to revive the coffee business there. He managed to take over the Bamboo Hedge coffee plantation, and was also able to get others to join the market for coffee. At one time there was about 20,000 trees’ producing coffee, but later arguments and assorted troubles in the coffee market started growing. Then in 2008 David Henry left the island, and once again production dwindled to only 2 acres left for the coffee production. In 2010 the St. Helena trading company limited along with Solomon and company St. Helena pic joined to increase the coffee production, and today it is making a come back. Quality controls were introduced allowing for the same excellent taste and quality to be produced. The area around the farm of Bamboo Hedge, and around Wranghams estate are now being cultivated, and planted for a renewed coffee production, so that in the future there will be a regular supply of this very tasty coffee. 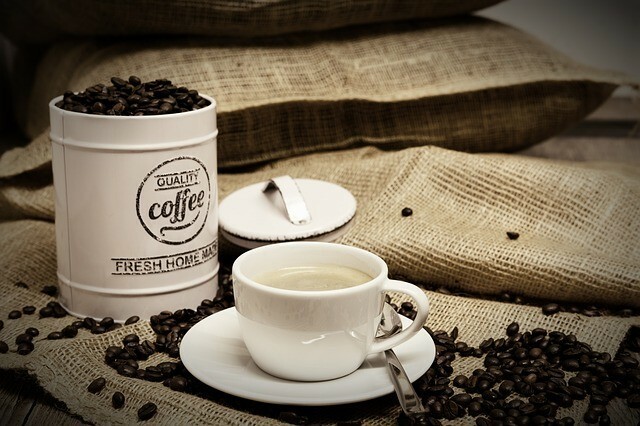 Another reason for the exceptional quality of this coffee is because of the small quantity produced is given much more attention too than coffee produced in other parts of the world. The excellent flavour of this coffee has won 2 Gold Start Awards for flavour by the United Kingdoms Guild of Fine Foods for this year. The coffee is sold by Sea Island Coffee of London England, a partner of St. Helena Coffee Company, and can be found on Amazon, where you can check for the price. Jamaican Blue Mountain Coffee is also world-famous for its mild flavor, and lack of bitterness. Also, like coffee from St. Helena it is very expensive, and has become another of the most valued coffees in the world today. Around 80% of the Blue Mountain Coffee is exported to Japan. The Blue Mountain region in Jamaica is considered ideal for growing coffee, the soil is rich, and the climate is cool and misty with plenty of rain. These are also some of the highest peaks found in the Caribbean, rising to 7400 feet. Only coffee that is certified by the Coffee Industry Board of Jamaica, can be considered Blue Mountain Coffee. It is grown at elevations between 3000 feet to 5500 feet, while other coffees such as Jamaican High Mountain are grown at elevations of 1500 feet to 3000 feet, and coffee grown below 1500 feet is called Jamaican Low Mountain or Jamaican Supreme. At the Jamaican Blue Coffee Company they use only the highest grade of beans that are roasted, cupped, and packaged in Jamaica before being sold. Because of the environment they grow in the beans take about 10 months from the bloom time to when there ready for harvest, where in other places it is usually 5 or 6 months. This growing season produces a larger more complex bean with concentrated flavors to it, and because it is grown in a very rich soil, this also helps to maintain the exceptional flavors of the coffee. For the Blue Mountain Coffee there is a lot of hands on care that goes into the process, the trees’ are planted i small groups because of the terrain of the land being very steep. The coffee pickers have to climb up and down these slopes, which are often very slippery from all the moisture, and the cherries don’t all ripen at the same time on a tree, so they have to be visited a number of times. This makes for picking the cherries an extremely labour-intensive process. The beans are processed after picking and graded by size, and to see if there are any defects in them. Then they are all sorted by hand for size, and usually they end up with about 85% of the beans being good enough for export. Before being exported they are once again inspected by the Jamaican Coffee Industry Board, than labeled 100% Jamaican Blue Mountain Coffee beans, and ready for those that are licensed to purchase and distribute them. Jamaicans know they have a unique quality coffee, and with all the hands on care given to it, this is another reason for the price being very high. This Blue Mountain Coffee can be found on Amazon, if you would like to try some, or check out the price. This is another island coffee that is rare and somewhat a bit expensive. It is grown in north and south Kona in the higher elevations where there is a rich volcanic soil, and a cloud coverage for most of the time. On the slopes of Mauna Loa and Hualaloi coffee trees’ have the ideal conditions for growing. Here there are about 4000 acres of coffee trees’, which is small in comparison to the rest of the world coffee farms. The bean cherries here have a very balanced flavor, and are unique in quality. The beans from here are considered Kona Coffee, and there are also some farms or coffee estates that also produce 100% Kona coffee. Because of the trees’ location they need to be picked by hand, and because the cherries don’t all ripen at the same time, it is a slow process, as you have to keep going back over the trees’. About 4000 beans are required to make a pound of coffee. The beans are sun dried, and than custom roasted, which is considered an art form in which to bring the coffees unique quality to you. The whole bean will stay fresh in a sealed container for up to about 2 months, and the ground coffee will last for about a month. When buying Kona coffee always be sure it is labeled 100% Kona, as there are Kona blends that contain a minimum of 10% Kona, and are much cheaper in price, and will not have the flavor or taste as the 100% Kona. So be sure to read the label before purchasing, because quite a few of the blends use the kona label. The Kona coffee is around 95% of all the coffee being grown on the big island. The rest is grown in Kau, puna, and along the Hamakua coast, and even some on the other Hawaiian islands. Three other coffees are grown on the big island, and are Kau, Puna and Hanakua. Kau coffee has a smooth taste, and an excellent aroma. It was in the top ten for taste in the world Speciality Association of America, convention. Puna coffee is grown on about 125 acres, and is another excellent coffee. Hamakua coffee is replacing what used to be sugar cane country, and grown on 5 to 7 acre farms. The hand-picked berries are rich in flavor with a smooth chocolaty finish. For 100% Kona coffee check out the price on Amazon, and see if you enjoy the flavor. The price for these three coffees is not cheap, but you are paying for something unique, and probably some of the best coffees in the world. If you get a chance to try these out, let me know how they taste to you.